This is an alarmed, single door, UL listed, push type panic exit crash bar. 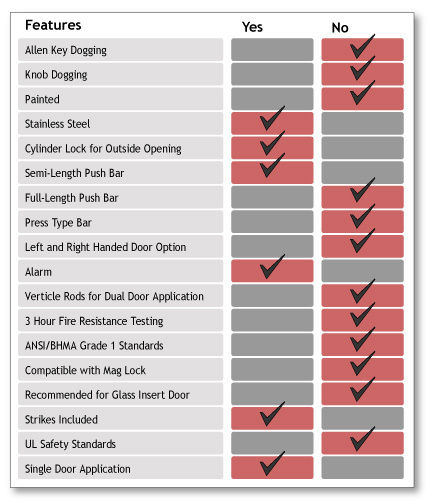 The 510-A Series panic exit bar by Sentry Safety provides installation options and security, as well as safety. The main feature of this model is the alarm function; when the push bar is pressed, the alarm is activated. This makes the 510-A Series perfect for any emergency exit that requires security, such as at a hospital, museum, or electronics store. This panic bar comes with a 5/8" (16mm) latch bolt, and a 5/8" (16mm) deadlocking bolt to create a secure connection between the door and exit device, ensuring that the panic bar will function properly for use after use. Additionally, the cylinder lock gives the user the option to install the appropriate accessories so the door can be opened from the outside. The cylinder lock connects to the internal mechanisms of the push bar by way of a 2 3/4" hole in the door.